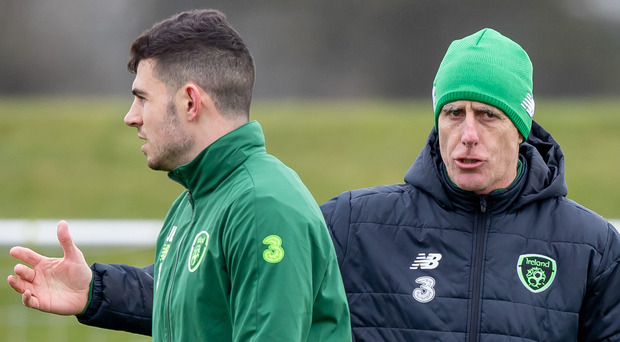 Mick McCarthy has told his Republic of Ireland players to forget a desperately disappointing 12 months as he attempts to usher in a new era. The 60-year-old yesterday morning took his first training session since being appointed manager for the second time and insisted he is looking forward rather than back with the opening Euro 2020 qualifier in Gibraltar on Saturday. The Republic won only one of the nine internationals they played in 2018, a return which ultimately proved fatal for McCarthy's predecessor Martin O'Neill, although the new man insists he has not even considered that run of results and whether it will affect the current squad. He said: "I've never even considered it. I've never thought about it at all. That's got nothing to do with me, what happened before. It's up to me to get positive results and have people smiling again. Let's hope I can do that. "But what went on before me is not my problem and not my responsibility. It's my responsibility to change that. I'll be doing my damnedest to make sure that's not the case and I'm sure the lads will. "They're all proud of being in here and wanting to do well. I doubt they'll be happy with that record. I didn't know that record, I haven't looked back on what's gone on. I'm looking forward and not considering what went on before me." McCarthy, who won 57 caps for the Republic as a player, famously guided the nation to the 2002 World Cup finals and is remembered fondly as a result. But asked if that would hold any sway with his players, he replied: "I'd like to think I get a good response from people because I've had nearly a thousand games as a manager and as a coach, and how I interact with the players. "Hopefully I get their respect because of that, not because of what I've done here. The last time I was here was 17 years ago. "Some of them might remember me playing, I don't know, or managing. They might have seen it on an 8-track or something." The trip to Gibraltar is one which should hold few fears for the Republic - they scored 11 goals without reply when the sides met home and away during the Euro 2016 qualifying campaign - but the manager will treat them with the utmost respect. He said: "It would be remiss of me if I didn't. I've never, ever done it at any level I've played at, treated somebody with disrespect, and I certainly won't be doing it on Saturday." It will be the Yorkshireman's first European qualifier since the night in October 1999 when a last-gasp Macedonia goal in Skopje scuppered the Republic's hopes of automatic qualification, and he bristled when reminded of it. He said: "Since then, I've had a few good results as well, so I think it's probably remiss of you to remind me of a night like that when I've had pretty much more nights since then that have been positive ones. "I've won the Championship twice and nobody ever mentions that. I've been in the Premier League and had a pretty good time since. Oh, and we qualified for the World Cup as well, but thanks for reminding me of one of my worst nights."